There almost wasn't a hand quilting category in the festival this year (it was one of the least requested categories when Amy asked for feedback but she kindly added it back in after hand quilters made their feelings known! *ahem*) so, to celebrate its resurrection and to show that hand quilting is alive and well, as well as in a spirit of 'use it or lose it', I've decided to enter one of my quilts. I'm afraid it isn't a new quilt as I haven't finished any quilts in quite a while (I'm hoping that I'll have my hexy quilt finished by the autumn festival next year - that's not a promise!) but then I remembered that I finished this quilt before I started blogging. I've mentioned it before as I entered it in The Great Northern Quilt show in 2011 so it will look familiar to some of you! Mam asked me to make her a lap quilt for the colder evenings and requested that it be red and gold. 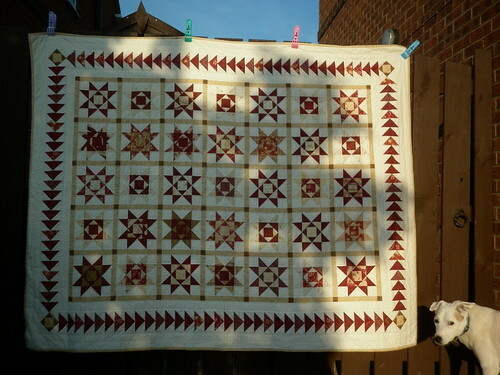 Her only other stipulation was that it had to have a border of flying geese so I designed this quilt from the outside in - not something I'd done before (I think this was maybe the third quilt I'd made, it was finished some time towards the end of 2010). I decided that I wanted the blocks to reflect the border so decided to piece Sawtooth Star blocks but added an economy block centre (or a square in a square in a square - I'm not very good with quilt block names, I'm afraid!) to add extra interest, both while piecing it and once it was finished! I seem to remember having quite a debate about what to do in the corners of the borders as I didn't want the geese to come to a dead halt at the edge so, in the end, decided to reflect the centres of the blocks and let the geese fly round the edge. It wouldn't be my usual choice of fabric but love the way this glittery fabric sparkles in the sun! The fabrics are quite traditional as that's what Mam likes - we spent quite a while choosing them from our LQS and stalls at various quilt shows - and they reflect the traditional nature of the quilt. It's got a cream flannel on the back which I remember being quite a bargain in a sale somewhere and the wadding is Hobbs Heirloom 80/20, a dream to hand quilt through. I used a YLI variegated thread to quilt and, having looked at the YLI chart, I think it was 'Pyramids of Giza'. This quilt is a favourite with my two young nieces who like to either be wrapped up 'like a doggy' in it (like Archie does with his quilts) or play 'sausage rolls' with it (lie, outstretched, at one end of the quilt, get rolled up in it (like a sausage in a sausage roll) and then someone pulls on the end and out you roll! Some people think that you need to be gentle with a hand pieced, hand quilted and hand bound quilt, I beg to differ!! Name: doesn't really have one! 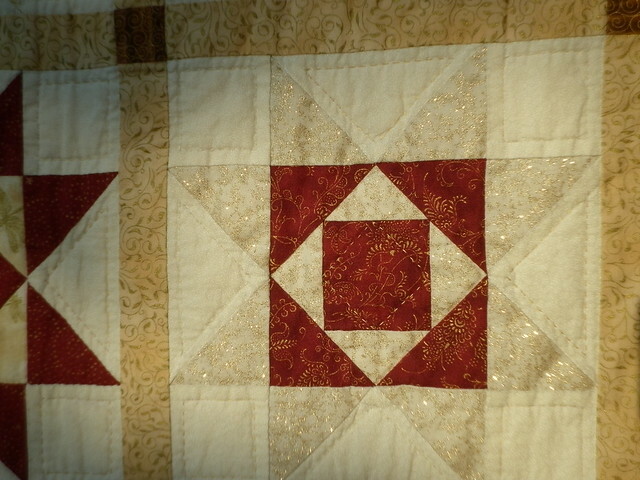 Commonly known as 'the red and gold quilt' or 'Mam's quilt'! Design: Sawtooth Star variation - designed by me, with lots of graph paper and a pencil. 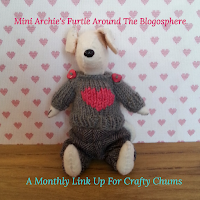 Backing: flannel/brushed cotton - lovely and cosy in the winter! Can we go in yet? You should be in there, sorting out my tea, not out here faffing! What a lovely quilt for your mam! I love it! Stars and flying geese, what could be better? Stars and flying geese. Red and gold. Hand pieced and hand quilted. Perfect!! I really like this quilt! Well done! I agree that handmade and quilted is strong!! Clever design! Like the corners too! Gorgeous! Mam has great taste in fabric and quilt requirements! Thanks for the work on keeping the hand quilted section in the festival! How cute is your little man? Look at him peeking around at you and basking in the sun! Love him. Your stars are gorgeous! Love how the variation in fabric makes each so unique. Lovely. 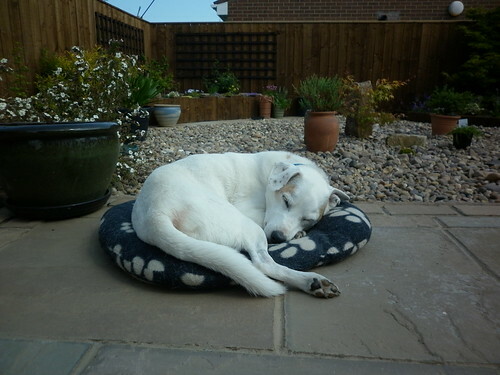 love that last picture of Archie - he looks so resigned! It's a wonderful quilt - I bet your mum loves it. I am always out of words reading about your hand quilting. I do not get a tiny bit done and you make an entire quilt. It is really beautiful. Hi Archie - I have missed you! Your mom has made beautiful quilt! We also love hand quilting! and geese even didn't make a quilt with them yet. Hugs from your friend Nero! blows me away that you hand piece as well as hand quilt!!! garden is looking great too. My goodness - all those perfect little stitches ... and it was your 3rd quilt?? wow! Oh Helen, I don't think I remember this one, it's beautiful and I think your corner treatment is perfect. Have a lovely mental picture of rolling your nieces about the floor in it. This is amazing Helen, and all done by hand is such an achievement! Great quilt beautifully hand quilted! I'm having visions of sausage rolling and keep thinking if it were me then I'd get stuck halfway unrolled! 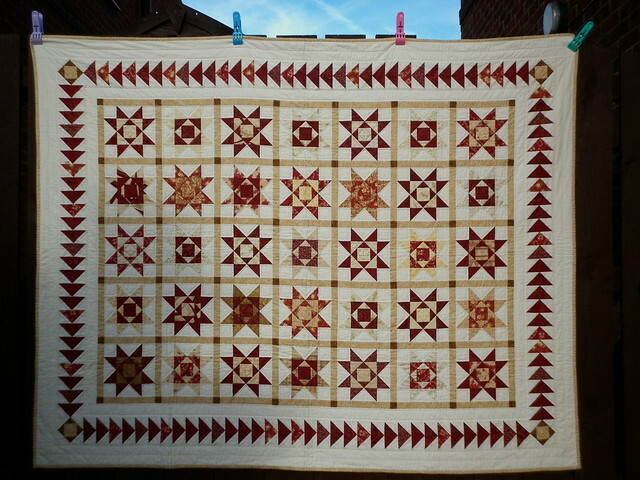 It's a gorgeous quilt - love the fact you not only hand pieced it, but also hand quilted it! That's a nice quilt ! This quilt is beautiful. 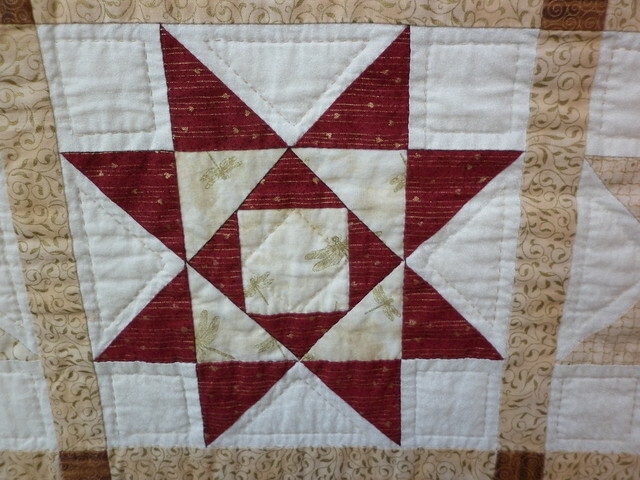 I love the hand stitching, it makes the quilt look so soft and inviting. Your quilt is beautiful! And good for you for standing up for hand quilters - it's where we all began, isn't it? Hand pieced and hand quilted! Wow. Mam sure is a lucky person to be gifted such a wonderful quilt. Love all the flying geese in the border. 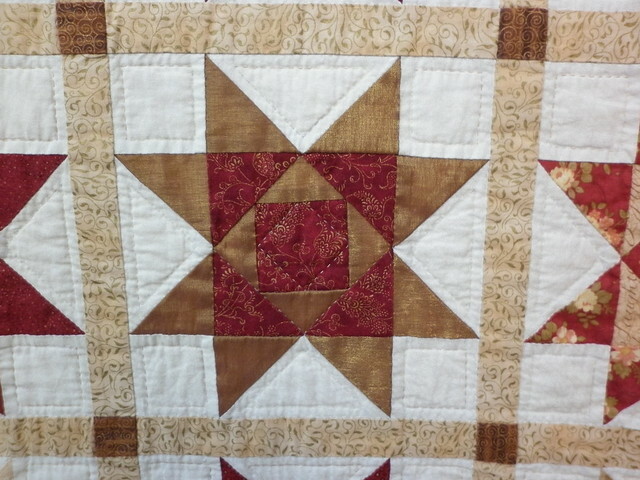 Gorgeous quilt and lovely hand quilting .... everything is perfect! It's an absolutely gorgeous quilt! And I'm blown away you hand piece everything! I read it on Susan's blog just the other day. Here's hoping we both have finishes in time for the next festival. Glad to hear they kept this category. hi great quilt but I love how the garden is coming along too!